Note: Do not reset the lamp timer if you have not replaced the lamp to avoid inaccurate lamp usage information. Select the Reset menu and press Enter. 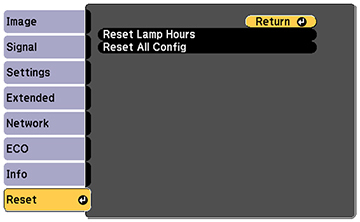 Select Reset Lamp Hours and press Enter. You see a prompt asking if you want to reset the lamp hours.